21313 Ship in a Bottle is a LEGO Ideas set to be released in 2018. Designed by fan creator, Jake Sadovich, Idaho, USA. 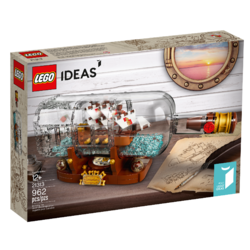 Continue a nautical tradition when you build the LEGO® Ideas Ship in a Bottle, featuring a highly detailed ship with the captain’s quarters, cannons, masts, crow’s nest and printed sail elements. Fan creator, Jake Sadovich, was inspired by an actual ship in a bottle that he had built a few years earlier when he decided to build a replica in LEGO brick form. His creation reached the qualifying 10,000 votes with LEGO Ideas. Features a LEGO® brick-built bottle, ship and a display stand. Bottle features a detailed, buildable cork with new-for-February 2018 wax-seal-style element and over 280 translucent-blue, water-style elements inside. Ship features a raised deck at the stern, captain’s quarters, 6 cannons, 3 masts, a crow’s nest and assorted elements including printed sails and the ship’s flag. Display stand features the ship’s ‘Leviathan’ nameplate, a built-in ‘compass’ (non-functioning) with detailed compass rose and spinning gold-colored needle, 2 globe elements and gold-colored detailing. Includes a booklet with building instructions, plus information about the set’s fan creator Jake Sadovich and LEGO® designers. This construction toy is suitable for ages 10+. Bottle on stand measures over 3" (10cm) high, 12” (31cm) wide and 3” (10cm) deep. Ship measures over 3" (8cm) high, 5” (14cm) long and 1” (5cm) wide. Facts about "21313 Ship in a Bottle"
This page was last edited on 9 February 2019, at 17:06.